Born in Matsue, Shimane prefecture. Graduated from Matsue Commercial College. Took a short course in watercolor from Ishii Hakutei in Matsue in 1913. Encouraged by Hakutei’s praise, he moved to Tokyo in 1915 and assisted Hakutei with the business of Nikakai. Although he studied formally with Okada Saburosuke, Ishii Hakutei was his mentor. At Hakutei’s suggestion he studied woodblock carving with the master carver Igami Bonkotsu for 10 months in 1915. Exhibited his first moku-hanga with Nikakai in 1916. 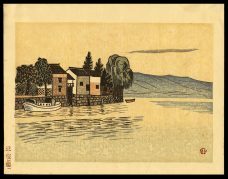 Returned to Matsue in 1918; remained until 1920. In 1921, back in Tokyo, he began work for the magazine Travel and Culture (Ryoko to Bungei). After the 1923 earthquake he learned to carve and construct frames for oil painters and in 1924 taught frame making in conjunction with Yamamoto Kanae’s farmers’ art movement. Member of Nihon Sosaku-Hanga Kyokai and founding member of Nihon Hanga Kyokai. From 1931 served as head of the print section of Kokugakai. Created several series of prints including Scenes of Tokyo after the Earthquake (Tokyo shinsai ato fukei), 1923-1927, and Scenes of Azuchi (Azuchi Fukei), 1931, and contributed to numerous group series. In 1939 exhibited 100 pieces of his collection of old Buddhist prints at the Tokyo Folk Art Museum. Contributed to Shi to hanga, Han, Shiro to kuro, HANGA, Dessan, Kasuri, Mura no hanga, and Han geijutsu. Supervised publication of Kitsutsuki in 1930-1931 and later Kitsutsuki hangashu in 1942-1943. Highly respected as pioneer of the creative print movement and teacher of many sosaku-hanga artists in short courses throughout Japan; taught extracurricular course at Tokyo School of Fine Arts 1935-1944. 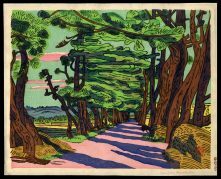 His early prints are principally color landscapes; later, from mid-1930s, black and white with influences from ancient Buddhist prints and early ukiyo-e. In 1962 moved to Washington, D.C., where he continued producing and exhibiting; works of this period include a series of 100 nudes. Used various kanji signatures; also, in mid-1920s, the letters “UN” carved in the block. ** Taken in whole, or in part, with permission from: Merritt, Helen and Nanako Yamada. Guide to Modern Japanese Woodblock Prints: 1900-1975. University of Hawaii Press: Honolulu. 1992.